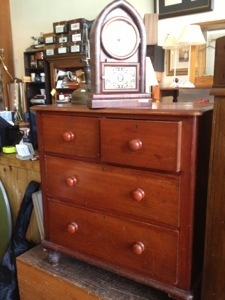 Two antique sets of drawers. 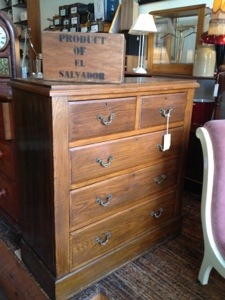 The first with metal bracket handles in English Oak, from the 1920’s. 1000mm wide, 430 deep and 1050 high. $395. And the second in cedar, with red pine drawer sides and dust sheets ( those wafers of wood placed between the drawers at each level to prevent drawer dust falling into the clothes ). 900 wide, 500 deep and 950 high. $495. 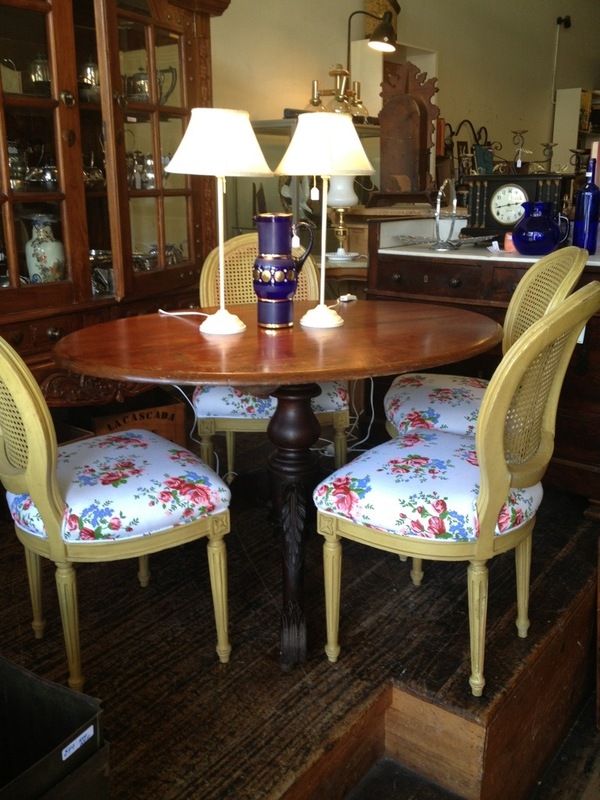 This French Style garden or outdoor seat is very sturdy and was created between 1950 and 1965. 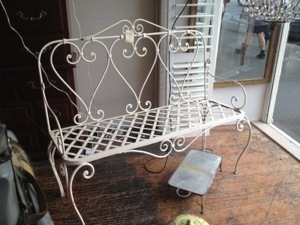 Made of wrought iron and highly decorative it would suit a large or small garden space. It is 1200 wide, 500 deep and 1000 mm high at the back. $340. 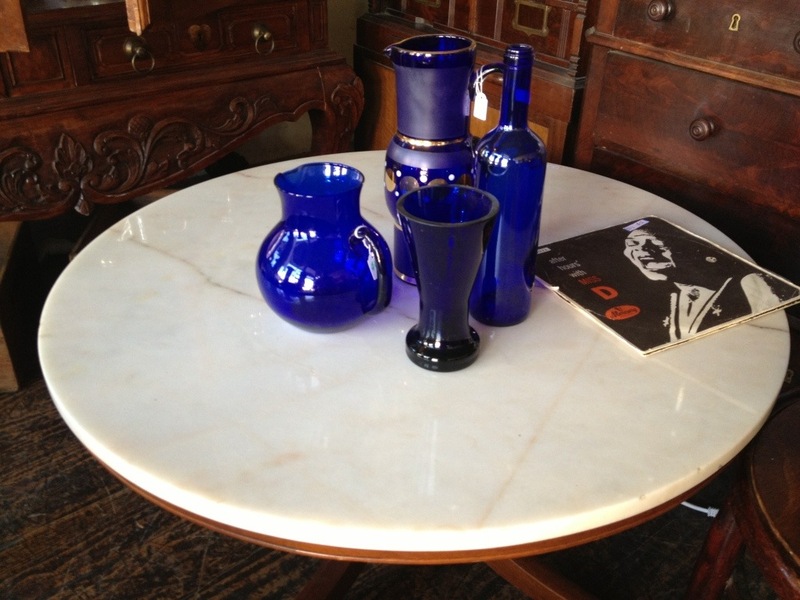 A selection of blue glass in the shade referred to frequently as Bristol Blue. Probably the only one qualifying as an antique is tapered vase in the foreground which we would regard as over 100 years old as a result of thickness of the metal, and wear or scratches on the base. $58. The taller jug is from the 70’s and is $47. The bottle and jug are modern pieces at $6 and $17 respectively. In the absence of the information marks found on china, often the only immediate clue to age will be the appearance of ground glass or wear on the base. Something only achieved by use over many years. The glasses are resting on a marble topped coffee table by Parker from the late 70’s. The line that may appear in the photograph as a crack to the left of top is in fact a vein or grain in the marble. $245. 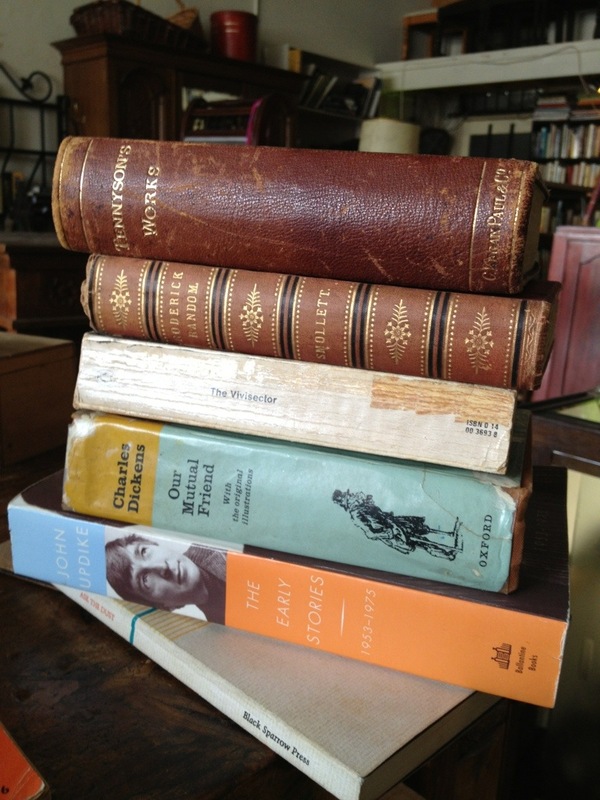 There is always a selection of a few hundred novels from the 19th and 20th centuries. Here we have The works of Alfred Lord Tennyson $28, Roderick Random by Tobias Smollett $14, The Vivisector, Patrick White $3, Our Mutual Friend by Charles Dickens $15, John Updike, The Early Stories $9 and Ask The Dust by John Fante in The Black Sparrow edition with an introduction by Charles Bukowski $12. The shop is open every day 10 to 5, closed on Sunday mornings ( just so we can do our hair ). An early 20th Century church pew in Oregon. 210 w x 50 d and 80 high at the back. This is the genuine article. $395. 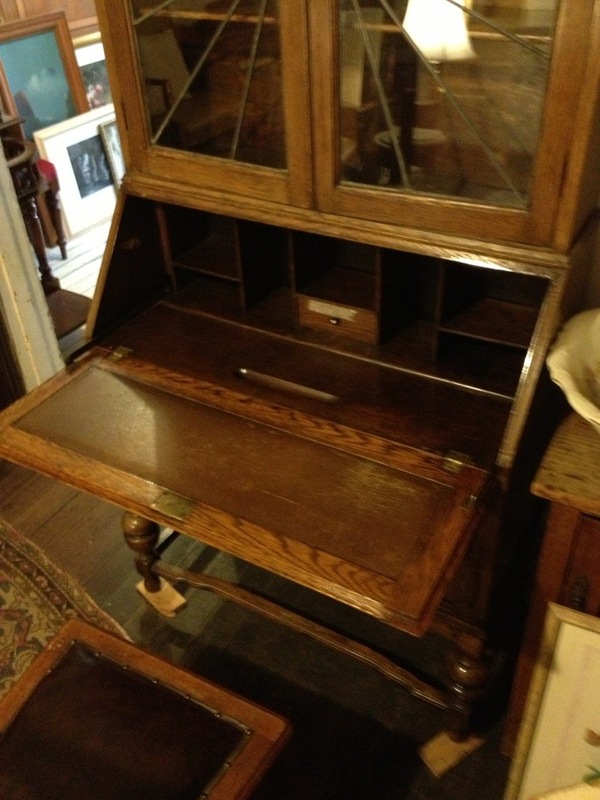 An English oak bookcase incorporating a leather topped writing table or desk with pigeon holes and drawer. 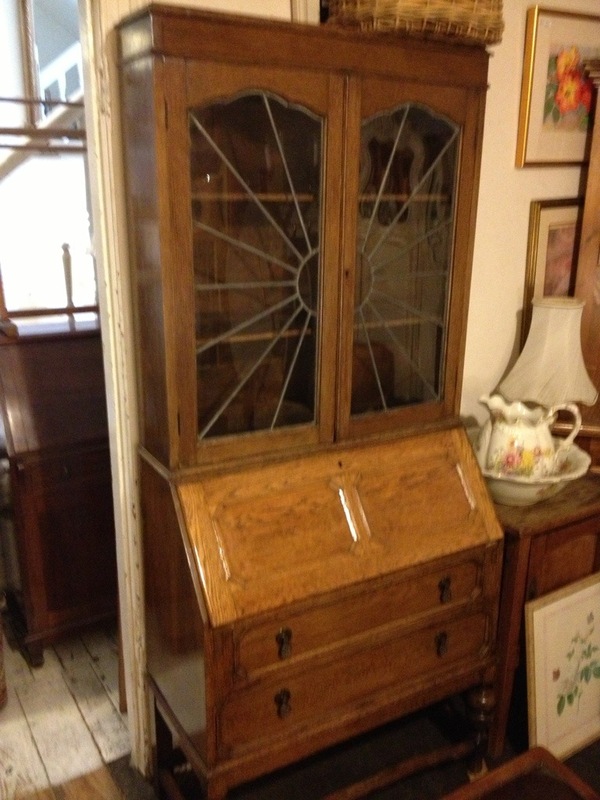 This piece separates into two for transport and the base includes two large drawers. Definitely made in England, probably 1910 to 1930. As previously mentioned in earlier posts, the small base size ( 40c x90c wide ) makes these desks suitable for the most compact rooms. Yet at two metres high it possesses many of the necessities of life. Bookcase, desk and storage below for papers or clothes. Pray don’t be put off by the blocks under the front legs. Due to the ancient and wobbly nature of our lovely old Victorian shop, the main i.e. most often walked on, part of the floor is about 2 centimetres lower than the bit next to the skirting board. This will not need lifters on a flat floor $865.